Dancercise - Strictly Dancing for the Over 55s. The Dancercise class will be closing for a summer break on 25/07/14 but an outdoor session will be held every Wednesday morning in August 2014 at The Lawe Top / North Marine Park at 10.30 am - weather permitting. Just go along if you want to join in. Normal classes resume on the first week of September 2014. Just because you've past the age of 21 more than once doesn't mean you have to hang up your dancing shoes. I've been going to 'Dancercise' classes in South Shields for a couple of years now and it always gives me a buzz. Dancercise is, as its name implies, a combination of dance and aerobic and strength building exercises aimed at ladies who wish to grow old disgracefully, and have a laugh while doing so. 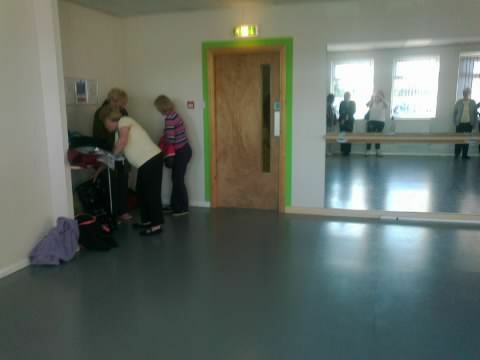 Originally held at WHiST (Women's Health in South Tyneside) the concept is a popular one devised by dance tutor Jean Leithead, who has been dancing and teaching Keep Fit since Jane Fonda was a lass (well maybe not that long). 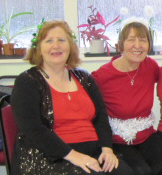 Due to funding cuts at the WHiST centre, Jean now holds classes in different venues in South Tyneside and offers a range of activities such as Line-Dancing, Keep Fit and Dancercise classes to suit a variety of fitness levels. I currently attend her class on Thursday afternoons at 'The Art of Dance' studios near St. Hilda's church in South Shields, but she also holds another class which mirrors our routines (or is it us that does the copying?) on Wednesday mornings at St. Jude's Church in the town. 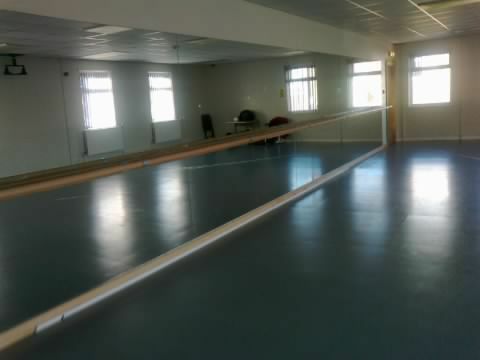 The dance studio has been purposely refurbished by its owners to accommodate children's and adult dance classes in the heart of the town centre and has stunning mirrored walls and solid wood dance floors. We simply hire the hall for the afternoon. What I love about it is the opportunity to dance with other women of a similar age and not feel like you're out of place or competing with each other but still learning some interesting steps and fantastic routines. The class starts with a combination of warm-up exercises and stretches, often dancing to a compilation of memorable tunes ranging from 1960s star Frank Ifield to Lady Gaga, just to get us moving. Jean then teaches us the new routine, which could be Salsa/Latin based, Irish or Cha Cha, to name a few. We have great fun doing our 'show stoppers' such as a routine using the theme from 'Pirates of the Caribbean' while dancing with scarves to add colour to the flow of movement and give our 'bingo wings' a work out. We've also done a version of '42nd Street' from the West End musical tradition, including struts and hand movements – and all that jazz. An accomplished dancer, Jean choreographs the routines herself and gives us the option of more complex steps to suit individual abilities. She is currently taking us through some classic Irish steps – so look out 'Riverdance' the grannies have got that glint in their eyes. Each routine lasts about six weeks, to fit around school term time. It often takes that length of time to learn the full routine, after which we may have a break then move on to something new, so you never get bored. I'm visually impaired and I love it because I can move around freely without my cane while still feeling safe and secure on level ground and in a comfortable environment. The other ladies accommodate my needs superbly and Jean takes the time to break each movement down into individual steps if necessary, so that we can all learn together. A few gentle reminders of a mambo, cha cha or Charleston step are all it takes to get us going and the variety of music soon gets us 'in the zone', even if the knees, shoulders and hips creak a bit, which is quite understandable as many of the ladies are in their late 60s and 70s. Recently, one member of the group happily announced that she would be 80 next year. I've even invested in a pair of jazz shoes to see if it improves my attempts at sashays and shimmies. One of the things I have difficulty with is if there is a lot of movement around the dancefloor, as required by the routine, as I can't follow the pattern of movement, for example in a Céilidh or Reel, but Jean is on hand and simply grabs my arm to take me round the hall and keep pace with everyone else. This really boosts my confidence and gives me the opportunity to participate in the dance and not be left out because of my disability. 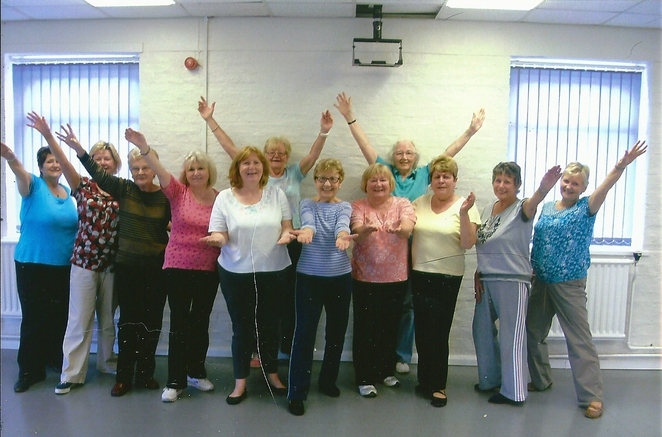 Many of her regulars have followed her to a venue near them since being introduced to dance classes at WHiST, which originally attracted funding from the local authority but the group are now happy to pay per session as we always come away smiling. The sessions usually progress on to a line-dance for one or two tracks, or perhaps a group dance such as a jig, reel or weave, as in Greek dancing, with everything done at a level you are comfortable with, so don't worry if you're not the best dancer in the class - I haven't taken formal dance lessons since I was a kid, and it's not a competition. We complete the session with a few minutes relaxation and stretching exercises to revive us before heading home - although there is a coffee bar at the centre if you wish to stay a bit longer. As an additional extra, Jean also organises occasional events such as the annual Christmas meal and/or trips to the theatre to see the pantomime, as well as fund-raising Céilidhs with her former colleague from WHiST – which offers a social outlet to the members of the classes, especially as this usually involves other groups, so we all get to meet up. I've never been all that sporty, but I've always loved music and dancing and finding an exercise that you enjoy is half the battle. It really does improve flexibility, balance and co-orination and stops the joints from seizing up. And gives you a buzz that lasts longer than tea and cake. So jazz hands at the ready, let's put on our dancing shoes. Dancercise classes with Jean Leithead are an hour long and are held at The Art of Dance Studios, Coronation Street, South Shields on Thursdays at 2pm and at St. Jude's Church Hall, Laygate, South Shields on Wednesdays at 10.30am. Classes cost £3.50 per session. Just turn up. All welcome. The Art of Dance offers classes in all kinds of dance including ballet, tap, Latin and hip-hop for children from the age of 3 upwards and has dance and fitness training for adults with experienced and qualified tutors and is operated separately under Principal Suzanne Stuart. See the webpage or phone 0191 4555252 for more information.